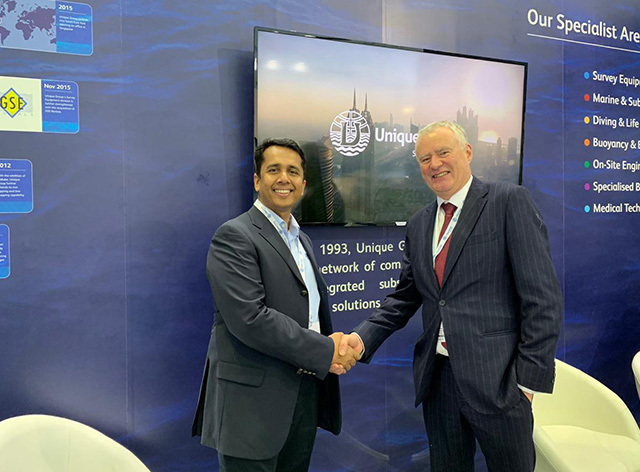 Unique Group, one of the world’s most prominent integrated subsea and offshore solution providers, has announced that it has entered into a cooperation agreement with Deepwater Corrosion Services Inc. As part of the agreement, Unique Group will offer Deepwater’s technologically advanced corrosion control solutions to the Middle East Market. Over the past thirty years, Deepwater who have offices worldwide, have been delivering world-class solutions to protect offshore infrastructure from corrosion by developing more efficient systems to protect, monitor and extend the productive lives of ageing assets. The solutions include cathodic protection (CP), permanent CP monitoring, CP design & engineering and corrosion inspection & survey. Deepwater’s sacrificial (SACP) and impressed current (ICCP) systems are well known in the corrosion industry as the designs are easily retrofitted. SACP systems include the RetroPod, RetroLink, RetroMat and RetroSled, all connected using the RetroClamp system, which can also be used to install and connect permanent monitoring systems. Some of the ICCP systems are RetroBuoy and RetroBuoy Junior, RetroMat ICCP and the Raparound Anode System.